The Stanley Cup has officially gone to the dogs, courtesy of Chicago Blackhawks forward Brian Bickell. 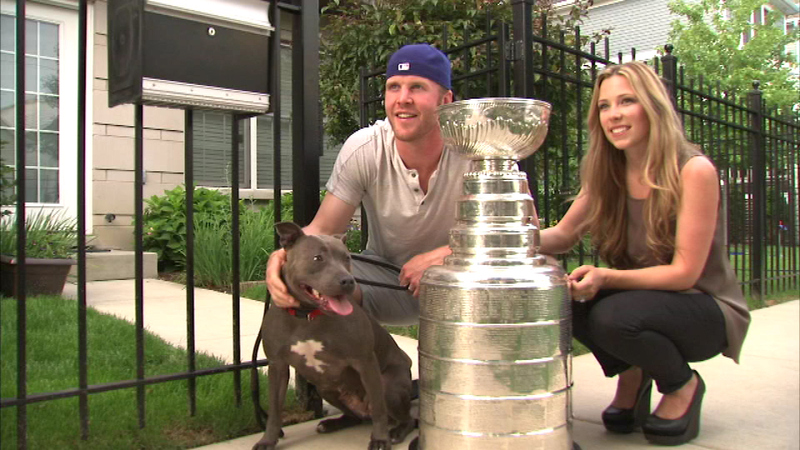 CHICAGO (WLS) -- The Stanley Cup has officially gone to the dogs, courtesy of Chicago Blackhawks forward Brian Bickell. The NHL Champion and his wife, Amanda, posed for pictures with six adoptable dogs next to the Stanley Cup. The "Stanley Pups" were rescued from high-kill shelters around the city and the couple is hoping they will find loving, forever homes. Each dog has a unique, hockey-themed name - Josh Zamboni, Duncan, Bickell, Lorde Sage, Crawford and, of course, Stanley Pup. For more information on the "Stanley Pups" visit" bickellfoundation.org. The Chicago Blackhawks championship celebration continued on the South Side when the Stanley Cup made a stop at U.S. Cellular Field before Sunday's White Sox game.